Learning at Nottingham Trent University has been the most beautiful experience of my life. "I am Thawdar Nway Oo from Myanmar. I initially studied a foundation programme in Business, Law and Social Sciences at Nottingham Trent International College (NTIC). After that, I continued to study for a Diploma in Business, which allowed me to progress into Nottingham Trent University. "I came to Nottingham when I was 17. 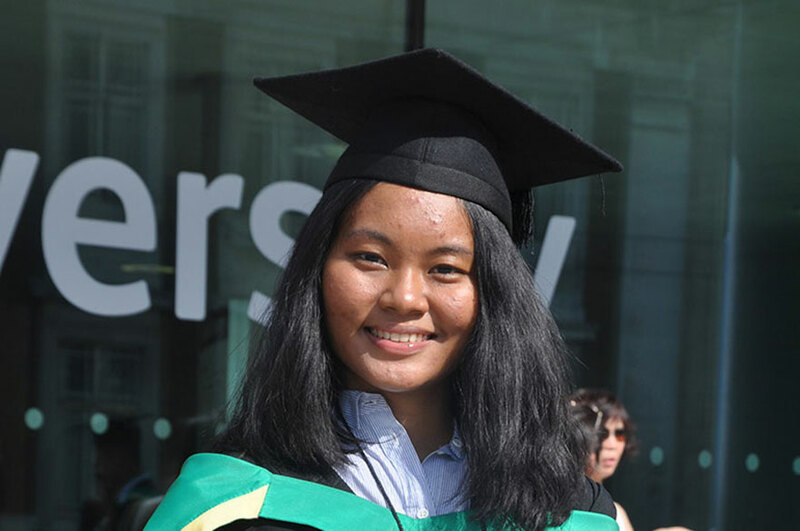 At that time I found it difficult to understand the UK education system because there are many differences between Myanmar and the UK, but the University provided me with lots of support to cope with the change. I soon made friends with some of my classmates and I spoke to international and local students as well as reading newspapers to improve my English language skills. "I majored in Business Management & Human Resources because it is an exciting programme for me. It covers all aspects of human resources within an organisation. The management of work and people are the most essential part of any organisation to achieve organisational goals and long-term competitive advantage - and this course has fully prepared me for a career in this exciting area. "Throughout my studies at NTU I had chances to meet different people from different countries. It was a fun-filled experience to work with students from all over the world. As one of my hobbies is travelling, I visited many cities and historic places while I was studying. I was amazed with the history, culture and the people of England. I found that the British people are very open to new cultures and very welcoming. "Learning business management and human resources at Nottingham Trent University has been the most beautiful experience of my life. The city itself is great. The library facilities are excellent and the students are friendly. The teaching staff are always there to help with anything you need. The employability team also gives me tips and advice that helped me in job interviews and job searches. There are lots of different events, career fairs and workshops held at the University which are really effective and useful. "Since graduating I have returned to Myanmar and I am excited to start my career in HR."